Yes, the first G.I. Joe was pretty to look at, but dumb. Much like its star. Of course, even if it was not everything it could have been, the gang at Paramount must be an optimistic bunch and so, there’s a sequel on the way. This time the movie is called G.I. 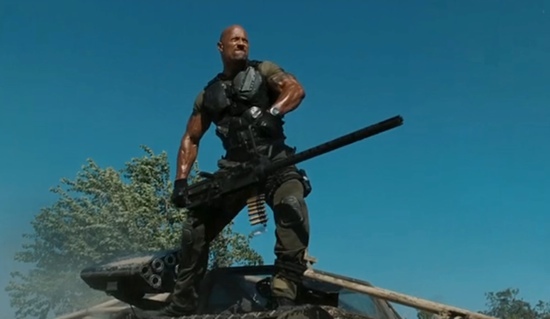 Joe: Retaliation and it stars Dwayne Johnson, Channing Tatum, Bruce Willis and Jonathan Pryce in a story featuring COBRA’s infiltration of the U.S. Government and the Joes saving the day. It’s directed by John M. Chu and written by Rhett Reese and Paul Wernick. Those are some pretty accomplished people, maybe this won’t be as bad as we think? Maybe. At any rate, there’s a new trailer for the movie for you to check out. Look for the movie itself to arrive on March 29, 2013. Though Green Lantern is prepping to be one of the larger superhero flicks of 2011 (in spite of the possible awesomeness of Thor and Captain America), Ryan Reynolds is still sticking to his word and planning on going back to his role as Wade Wilson, aka Deadpool. In a recent interview with Hero Complex, Reynolds delves into the emotional trauma of the Merc with the Mouth and how much of a mess it will be to get into that character. Many fans became smitten with him in that role after his performance in the poorly received X-Men Origins: Wolverine last year. Now, Reynolds has wrapped GL, is promoting Buried, and can’t wait to start killing people for money on film. While it was only a rumor back in December, it looks like Fox has finally tapped writers Rhett Reese and Paul Wenick, who are most notably the writers of 2009’s hit Zombieland, to pen the upcoming Deadpool film — which is spun off from last year’s X-Men Origins: Wolverine. There is no timetable on the Marvel property, though Reynolds has a window after wrapping the “Green Lantern” this summer. Reynolds has been bulking up to play the DC Comics’ hero “Green Lantern,” which starts lensing next month. This means he would already be in superhero shape if the script for “Deadpool” is ready by summer. Reese and Wernick will stay true to the mythology of “Deadpool” given that Reynolds is a huge fan and protector of the property. This is all good news coming from the Fox camp, since fans were a bit worried when Reynolds was signed as both a DC and Marvel film hero. Reese and Wenick are no strangers to the comic-to-film world, as they also penned a draft of Venom for Sony and Marvel last year. With Ryan Reynolds becoming a hot commodity in the world of Comic Book films, between getting signed as Green Lantern and Deadpool, it looks like things are still heating up for a Deadpool film over at Fox. CHUD recently got word that Zombieland writers Rhett Reese and Paul Wernick are allegedly penning a script for Deadpool. Most of the film and comic fan community was torn on the thought of a Deadpool film after seeing what the studio did with the character in May’s X-Men Origins: Wolverine, but Reynolds himself stated that the film will be “just like the comics”, including the mask, schizophrenia, and demolition of the fourth wall. Up next for the Zombieland scribes is actually a sequel to the highly successful undead comedy. Word is that Zombieland 2 will start production next year, and will be shot in 3D. There’s no arguing that the proliferation of file sharing technology (e.g. BitTorrent or similar) has changed the industry for content creators. Never before has it been easier to acquire free movies or music. Or has it? For the last several years we, the consumers, have had to endure the complaints (dare I say whining) of movie studios and the recording industry. Both industries cite digital piracy as the root cause of their financial loss. Funny how this argument rarely (if ever) surfaced during the days of analog. Piracy of content has been going on for decades, long before the Internet was around. With the advent of the VCR and Cassette Recorder (which I guess would technically be an ACR) people have been able to duplicate content with relative ease. I remember when stereos started to come out with not one but two cassette bays for this purpose alone. Drop in a master tape, then a blank tape and copy away. The same was true for movies. I had friends who subscribed to their movie channel of choice, and then regularly recorded movies from the television to tape for later viewing. All one had to do was hook up two VCRs and you could easily duplicate those tapes for friends. All those years of consumers pirating content and hardly a word from media moguls about lost revenue. Fast forward to today. It seems not a week goes by without someone in the world of entertainment getting on a soapbox and crying fowl over the horrors of piracy. On the box this week: Rhett Reese, co-writer of Zombieland.